In 2017, 130 million Chinese tourists spent USD 274 billion while travelling abroad. They now make up 21 percent of the total tourism spending worldwide. The number of affluent Chinese tourists is expected to grow in the coming years with more Chinese citizens travelling abroad. Changes in demographics bring a new type of Chinese tourism, with an increase in wealthy Free Independent Travellers who tend to be mostly females, younger and digital-savvy. Luxury retail, travel and hospitality brands are often ill-equipped to attract potential Chinese consumers. Only 1 percent of affluent Chinese travellers will purchase luxury goods from a brand boutique, favouring instead duty-free department stores. 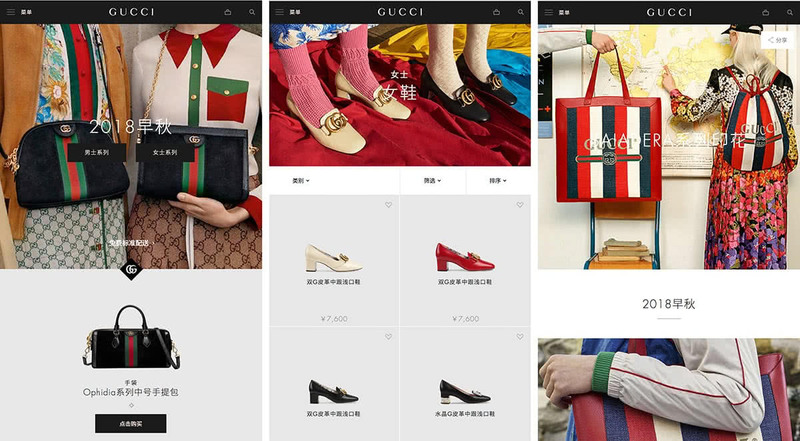 Language-barrier and the different online habits of young affluent Chinese consumers make it hard for luxury brands to know how and where to invest their marketing efforts. Establish your brand presence at critical decision moments in the consumer journey before and during the two key holiday seasons. Focus on digital channels that are most relevant to your Chinese audience. Help plan their trip with up-to-date information, store locations and inventory ahead of time. Provide appropriate payment options and translate relevant communication materials in Mandarin. International Chinese tourism continues to grow. Its impact on the global luxury travel and high-end hospitality industry is significant. Retailers, but also luxury hotels, restaurants, and travel companies need to adjust their offering and marketing strategy to engage with an affluent Chinese audience whose purchase behaviours are driven by different expectations. In this report, Luxe Digital explores the current state of affairs with an in-depth analysis of today’s Chinese outbound travel market. We then discuss the top 4 most important trends that are changing the nature of Chinese consumers travelling abroad. Finally, we conclude with a practical guide for luxury brands to engage with their affluent Chinese customers. You will understand who the affluent Chinese travellers are and why they matter to your business. You will also discover how you can adapt your sales and marketing strategy to tap into the massive opportunity that international Chinese tourism represents. Chinese tourists now make up the majority of the international outbound travellers. In addition, each Chinese traveller spends on average more per trip than travellers from any other nationality. In 2017, Chinese tourists spent USD 274 billion while travelling abroad according to the International Association of Tour Managers. That amount represents an increase of 5 percent over the previous year. In parallel, the total number of trips taken by Chinese tourists in 2017 reached 130 million, increasing by 7 percent from the 122 million trips taken by Chinese travellers in 2016. 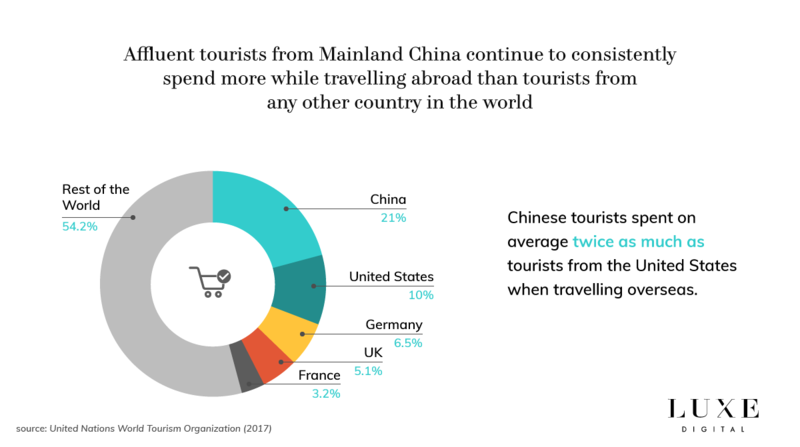 In addition, affluent tourists from Mainland China continue to consistently spend more while travelling abroad than tourists from any other country in the world. A research by the United Nations World Tourism Organization (UNWTO) found indeed that Chinese tourists spent on average twice as much, for example, as their counterparts from the United States while overseas. International tourism spending from Chinese tourists makes up 21 percent of the total tourism spending worldwide according to that same report. The contribution of outbound Chinese tourists to the total number of worldwide outbound travellers is only set to accelerate in the coming years. China is considered to be the world’s fastest growing tourism market, in an industry that is expected by the UNWTO to exceed 1.8 billion international travellers as a whole by 2030. Thailand and Japan remain the two preferred travel destinations for travellers from China. In 2017, Thailand welcomed 9.8 million tourists from Mainland China, representing 28 percent of its total inbound tourism. Japan, on the other hand, attracted 7.35 million Chinese travellers, representing 25.6 percent of its total inbound tourism. With new flight connections, fewer visa restrictions and better exchange rates, other destinations are growing fast. This is particularly the case for emerging markets in the Mediterranean region, such as Morocco, Turkey and Tunisia. The Czech Republic, Germany, Spain, the United Arab Emirates, England, the Netherlands and Iceland are also part of the top 10 fastest growing destinations for Chinese tourists in 2017. 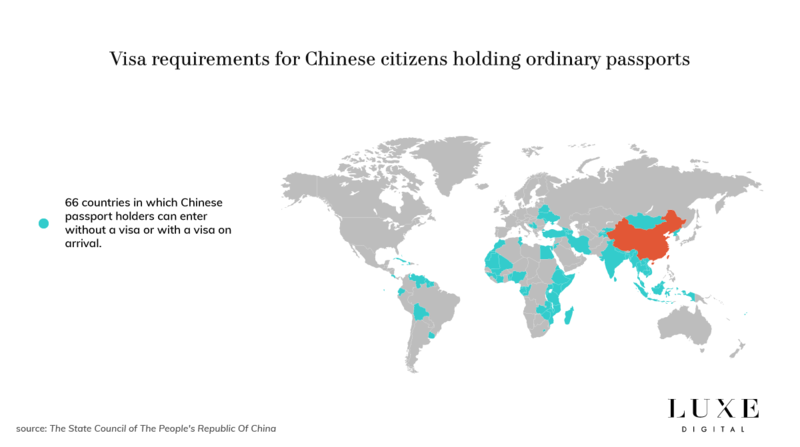 Interestingly, the number of countries that allow Chinese citizens to enter without a visa or with a visa on arrival (VOA) has increased to 66 in the recent months. Twelve of these countries now have a mutual visa exemption agreement with China. Another 15 of these countries have allowed unilateral visa exemption. The remaining 39 countries have allowed unilateral visa on arrival. The competition between countries to attract Chinese tourists is arguably heating up. The Chinese New Year holidays: defined by the lunar calendar, usually take place each year at the beginning of February. The Golden Week break: takes place each year over the first week of October, usually for a period of eight days. These two important dates in the Chinese calendar see an extraordinary number of tourists travelling both domestically and abroad. The 2017 Golden Week break, for example, saw Chinese travellers taking 705 million domestic trips and 6 million international trips over the eight-day holidays. Interestingly, the National Tourism Administration of China indicated that, while the number of outbound tourists grew by a steady 5.1 percent compared to the same period in 2016, more travellers were favouring independent trips instead of joining the traditionally popular tour group (more on that below). The profiles and demographics of Chinese tourists are gradually changing. The China Tourism Academy indicates that the majority of Chinese travellers are now travelling without an organised tour. This is an important behavioural change as organised travel tours used to be the norm for Chinese tourists travelling abroad. Travellers from the Tier 1 cities of China are leading the trend towards free independent travel (IDT). Tourists from the second, third and fourth-tier regions, on the other hand, continue to favour group travels for now. But as with most trends in China, Tier 2 cities and above tend to follow the path of their bigger Tier 1 counterparts, so we expect the growth of independent travellers to accelerate in the coming years. The future is not all gloom for Chinese travel agents, however. Many Chinese tourists are looking for help organising highly custom itineraries and experiences abroad. Bookings for personalised holidays have indeed increased by 400 percent in 2017, while themed holiday packages increased by 250 percent. The growing proportion of women travellers among Chinese tourists is also having a significant impact on the type of holidays and travel destinations. Chinese female travellers are more likely to travel abroad than their male counterparts. 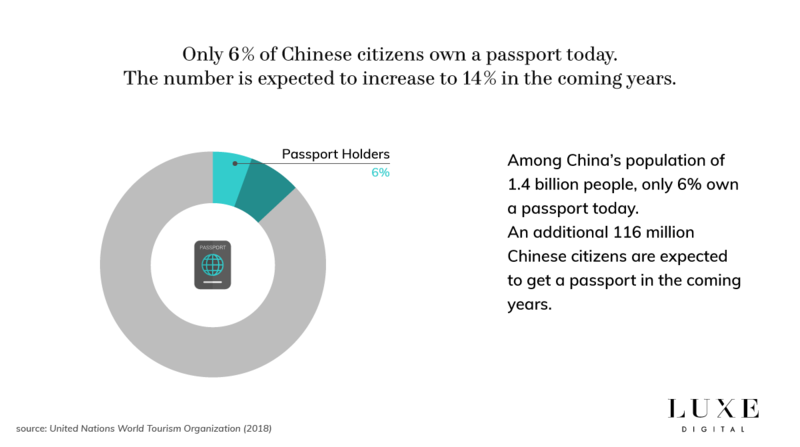 Based on current demographic distribution in China, we can expect the trend to accelerate in 2019, with an estimated 59 percent of outbound tourists being female versus 41 percent male. To understand what this evolution means, it’s worth looking at online travel platforms such as Ctrip that helps affluent Chinese Millennial travellers explore and select experiences and destinations for their next vacations. Reservations through the website increased by 220 percent in 2017. Owners of the travel site explain that their users are heavily influenced by what they saw on social media and pop culture entertainment when deciding where to travel. Chinese shoppers abroad are more digitally-savvy than most of the other countries’ travellers. Affluent Chinese tourists expect readily available Wifi connections and mobile functionalities such as store localisation, stock availability and price transparency when travelling. Digital plays a critical role before, during and after their holidays. Affluent Chinese tourists will base most of their travel-related decisions on the reviews left by other travellers online. They will compare different destinations and search for discount and deals on travel websites. Chinese travellers are mostly heading to WeChat and user-generated content platforms such as Mafangwo and Fliggy to find information but also plan and book their trips. Intelligence firm Coresight Research reported last year that 72 percent of Chinese travellers were influenced in one way or another by what they saw online. That’s 12 percentage points more than the global average. Digital media such as travel websites, social media platforms, online travel agencies and social trip planning platforms are thus essential to drive Chinese tourists’ behaviours. Beyond digital and social media, popular entertainment also influences how Chinese travellers decide where to go. According to a 2017 Global Travel Destination Report by social trip-planning site Mafengwo, 24.5 percent of Chinese travellers are influenced by TV, film and variety shows. 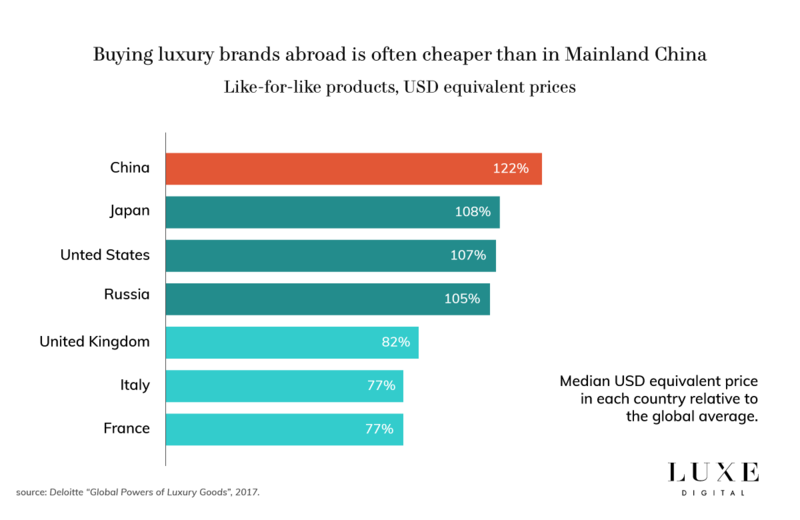 Luxury shopping accounts for the largest share of travel expenditures for affluent Chinese travellers abroad (25 percent, versus 19 percent for accommodations and 16 percent for dining). While the demand for experiential travel is growing, shopping remains a key draw. 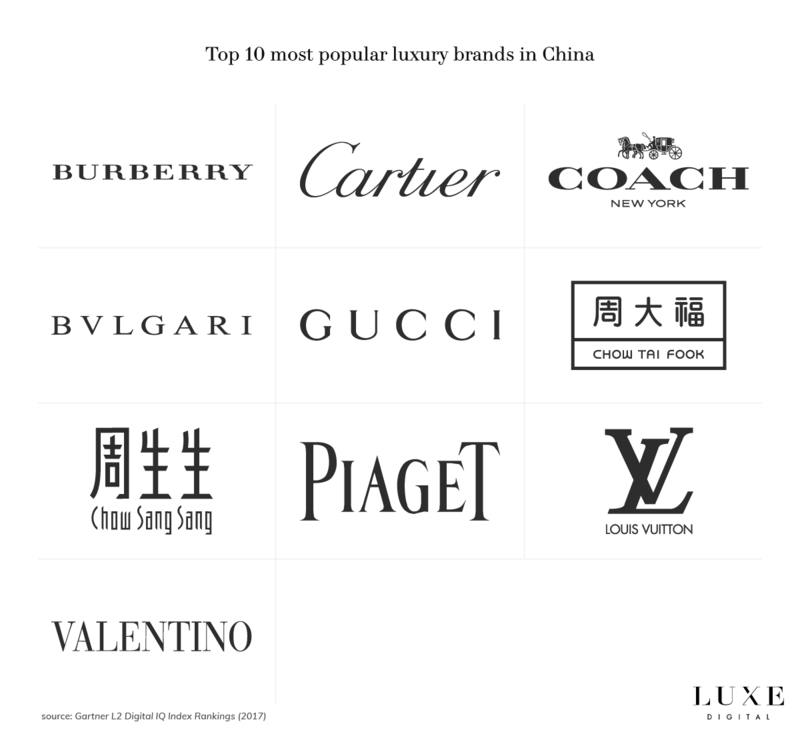 Most Chinese shoppers gravitate towards the most popular luxury brands in China. But buying abroad, especially in Europe and the United States, also guarantees that the luxury goods are genuine. Counterfeit product sales are such a widespread problem for luxury brands in China that consumers are often afraid to purchase high-end goods at home. When offered prices that are identical to overseas outlets to purchase luxury items in China, only 70 percent of affluent Chinese shoppers said they would choose to purchase the item at home. This surprising number illustrates the level of dissatisfaction that wealthy Chinese consumers experience when buying luxury goods in China. Affluent Chinese consumers are less satisfied with customer service and the general store experience when purchasing luxury goods at home. The importance of buying luxury items abroad has become such a phenomenon that we’ve seen in recent years the rise of ‘Dai Gou’s’ or personal shoppers: Affluent Chinese tourists who buy luxury items abroad to then sell them back to their friends once they return to China. Travelling abroad to shop is particularly important for the wealthy Chinese consumers who take on average 5.9 international trips per year and account for a major share of China’s outbound travel. High-Net-Worth Individuals (HNWIs) in China indicate shopping as the primary reason for selecting Hong Kong, South Korea and Japan as their preferred travel destinations. China is a large market with significant consumer habit variations between provinces and cities. In its 2017 China Outbound Tourism Travel Report, the China Tourism Academy identifies the top 20 departure cities for Chinese outbound tourists in 2017. With the exception of Beijing, Shanghai, Guangzhou and Shenzhen, all the remaining 16 cities in the top 20 are newly elected Tier 1 cities. 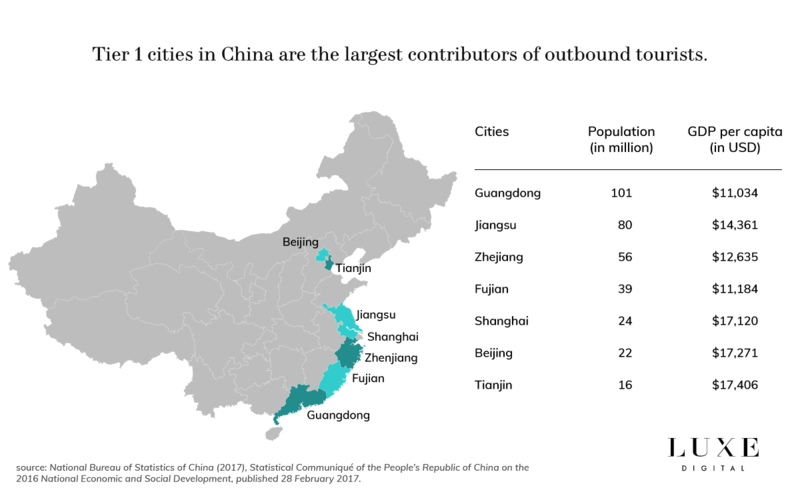 Remarkably, the world’s five fastest-growing cities for outbound tourism are all in China. Tier 1 regions in China include Beijing, Shanghai, Guangdong, Tianjin, Zhejiang, Jiangsu and Fujian. These regions host the population with the largest disposable income per person in China. This rapid rise of new Tier 1 cities in China highlights the important domestic changes that are taking place in the country. It also demonstrates the enthusiasm of the new affluent Chinese consumers to spend their money on travelling abroad. Chengdu, for example, overtook Shenzhen as the third largest contributor of outbound tourists from China with a 75 percent increase in international travels in 2017. Other cities such as Xi’an (323 percent growth) and Changsha (up by more than 232 percent) are also rapidly ranking up. Luxury retailers, high-end hotels, fine-dining restaurants and premium travel companies are all trying to attract and engage the affluent Chinese tourists visiting their country. As illustrated above, the sheer size and revenue potential of that audience dwarf most of the other consumer segments. In the next section, you will learn specific tactics that can be applied throughout the Chinese traveller’s purchase journey and discover key drivers behind the affluent Chinese consumer behaviours. Affluent Chinese tourists will often go to incredible length in planning their vacations ahead of time. Booking their flights and hotel rooms is only the beginning. Chinese travellers will often select the restaurants where they’ll eat during their trip while browsing online at home before their departure. They will also carefully map out the different stores that they want to visit. They’ll decide exactly what items they’ll be purchasing and where to get the best prices. This is especially the case when buying luxury goods. 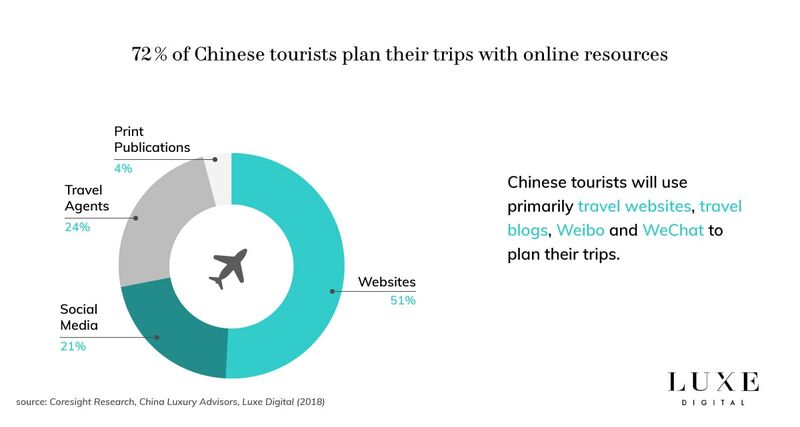 For the vast majority of Chinese tourists, the research phase will start on the brand’s website but also on social media, travel blogs and WeChat. The research and planning phase is especially important for free independent Chinese travellers (FIT) who rarely speak the language of the countries they will visit during their vacation and thus rely heavily on the suggestions of online influencers or friends who have travelled there before. Manage your presence on Baidu’ search engine. While this might seem obvious, successfully building and maintaining a brand website for a Chinese audience is often poorly executed by international brands. Making sure that your content is translated and localised in Mandarin is only the first step. You also need to make sure that your site is available from within Mainland China. Because planning every detail of their itinerary is critical for affluent Chinese tourists, you need to make sure that you have a store locator with a map service that is usable in China as well. Most luxury brands tend to use Google map for their store locator, but that option won’t work for your users in Mainland China. Your store locator should include both your boutiques in China and abroad, ideally with a feature to suggest itineraries. You should also include an option to print your stores’ maps in both Mandarin and the local language of the store’s country. That way, your Chinese consumers can provide the printed map to their taxi driver when they don’t speak the local language. Details on the potential presence of Mandarin-speaking staff in your stores should also be included. WeChat is by far the most popular messaging app in China. It reached 1 billion monthly active user accounts in March 2018. The app, that was first launched in 2011 by Tencent, has become much more than just a messaging app. 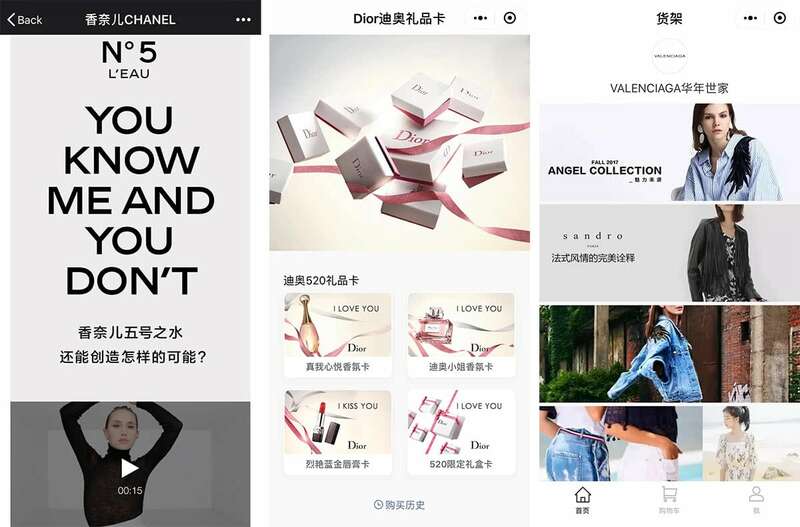 WeChat now acts as a central hub for the digital life of most Chinese consumers. They use it to communicate, of course, but also to pay their bills, purchase goods and services, or book restaurants and movie tickets. In fact, 83 percent of all smartphone users in China use WeChat. That number increases to 93 percent in China’s Tier 1 cities. To put it simply, you can’t have a successful omnichannel marketing campaign in China without being present on WeChat. Social media influencers and key opinion leaders (KOLs) have proven their effectiveness to drive luxury brand awareness over the past few years. China’s influencers are no exception and their role is especially important when trying to appeal to an affluent consumer base that aspires to an international lifestyle. Having a Chinese influencer post a photo of themselves in your store or with your product while travelling abroad can generate instant brand awareness. High-end fashion brands have already seized the opportunity by inviting Chinese KOLs to their fashion shows and giving them exclusive preview access to their new collections. Baidu is the dominant search engine in China with over 70 percent of all domestic search queries taking place on the site. The rules to appear at the top of Baidu’ search results page are different from Google. If you have a significant marketing budget and a long-term horizon, you should invest steadily in your SEO and grow your organic traffic with Baidu. In addition to the obvious translation of your content in Mandarin, you will need to host your website on a Chinese server for speed and accessibility. It’s important to note, however, that Baidu does not limit the number of advertising that will show at the top of its search results. Unlike Google, it’s common on Baidu to have the entire first page of the search results featuring exclusively advertising. 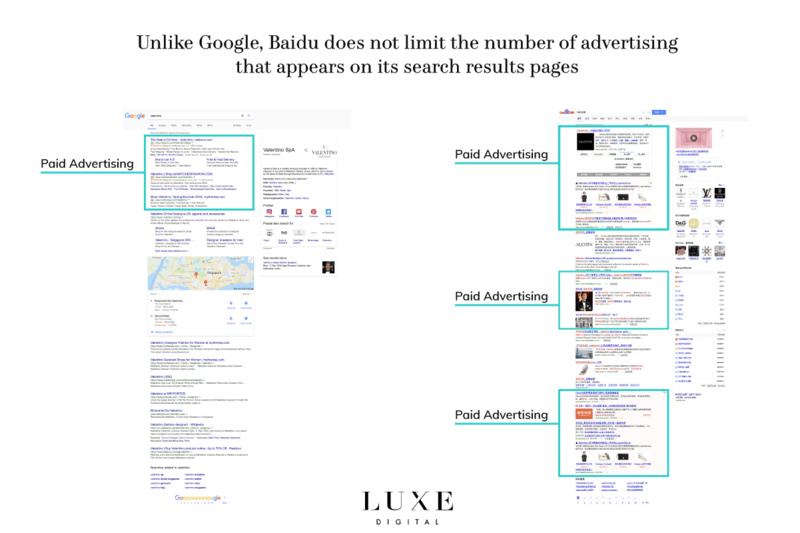 Searching for luxury brand Valentino online provides widely different results on Google and Baidu, the latter being mostly dominated by paid advertising. As a result, most luxury brands need to invest in paid advertising if they want to reach their affluent Chinese consumers, particularly ahead of the two important travel seasons of the year. 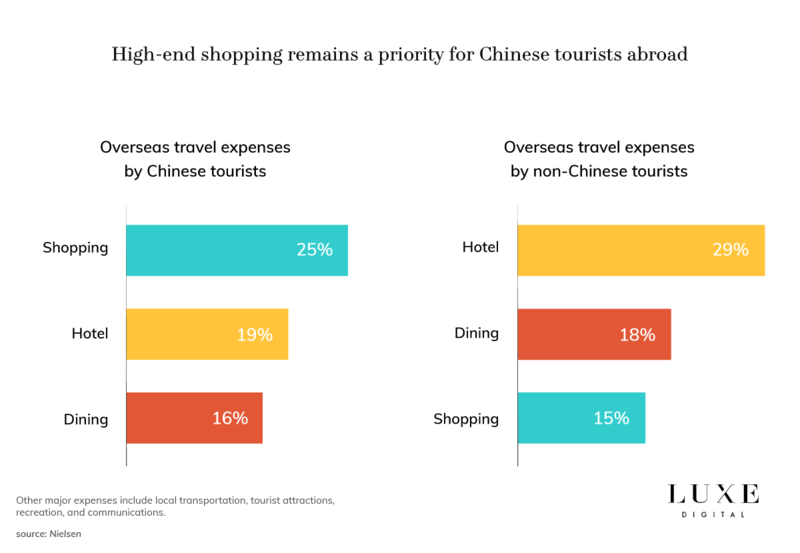 As discussed above, the majority of affluent Chinese tourists will already have planned their entire trip in great details well before starting their vacations. Continuing to engage with consumers on WeChat. Just having your retail staff learning a few key phrases to welcome your Chinese customers in Mandarin and answer the most basic questions will go a long way. Much better though would be to hire Mandarin-speaking full-time staff. Most high-end boutiques in Paris and London already do that. Affluent Chinese shoppers prefer buying luxury items abroad because they are unsatisfied with the poor customer experience that they receive at home. Luxury brands should thus pay a particular attention to delivering an impeccable experience to their Chinese visitors. Affluent Chinese shoppers are used to purchasing everything they want with WeChat Wallet or Alipay when at home. Offer the options to your Chinese customers, with the respective payment providers’ logos clearly displayed on your storefront, to alleviate the fear of not being able to pay with their bank card or having to carry on an excessive amount of cash with them. 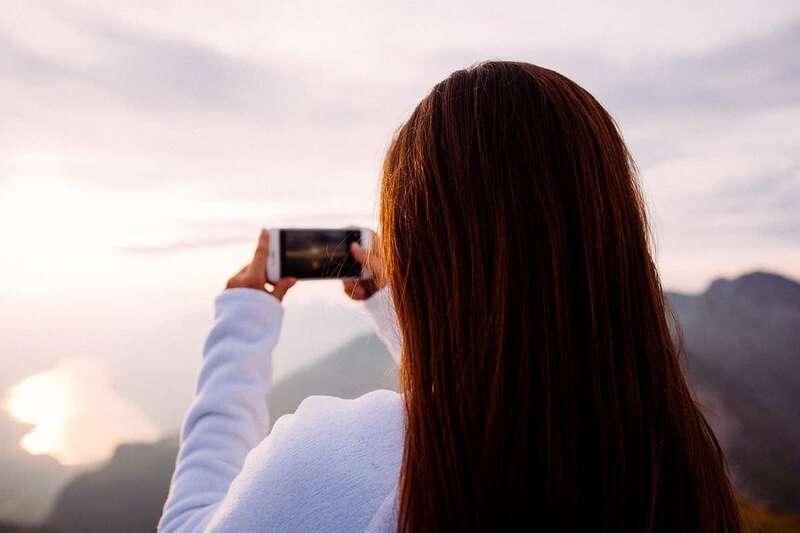 Affluent Chinese tourists will crave Internet connection while travelling to post photos of their holidays and share updates with their friends. This is the perfect opportunity for luxury brands to activate their audience by sending them notifications with helpful information about their store locations for example. Make sure that driving directions to reach your store are readily available in both Mandarin and the local country’s language, that way your Chinese customers will be able to share them with their taxi driver on their phone, for example. Affluent Chinese travellers are having a significant impact on the destinations that they travel to. 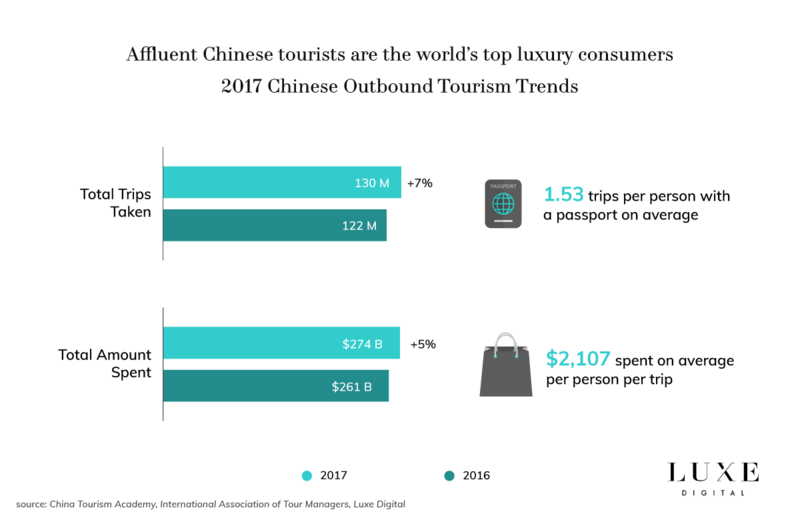 As the number of international travellers from China will continue to grow in the coming years, it is critical for luxury brands in the hospitality, travel and retail industries to understand what affluent Chinese consumers favour and expect. Luxury brands should tailor their offerings to capture these high-net-worth spenders if they don’t want to miss what is already an incredibly profitable segment. 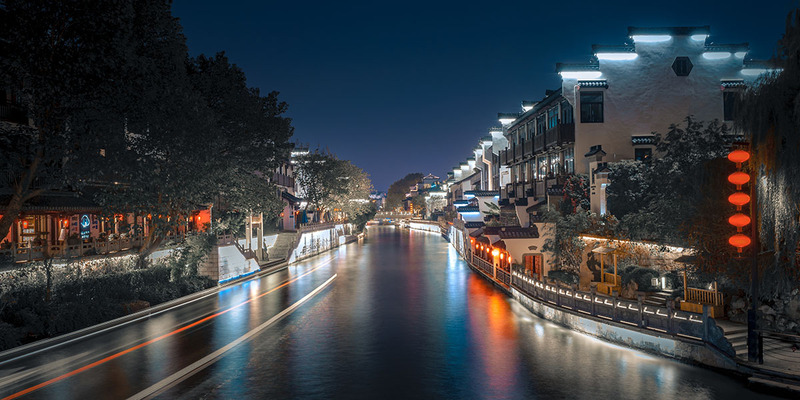 China’s booming bespoke tourism market and the increasing number of digital-savvy Chinese travellers certainly open up new opportunities for a wide range of businesses — from retail to hospitality. The modern affluent Chinese travellers are craving an international lifestyle and personalised experiences that go beyond traditional luxury shopping. Brands only need to be able to speak the right marketing language to appeal to them. The International Association of Tour Managers refers to “overseas travel of Chinese tourists” as the travel of residents of Mainland China to other countries or regions, including to Hong Kong, Macao, and Taiwan. International Association of Tour Managers. 2017 China Outbound Tourism Travel Report by the China Tourism Academy and Ctrip, 2017. UNWTO Workshop on Chinese Outbound Tourism Market, United Nations World Tourism Organization, January 2018. UNWTO long-term forecast, Tourism Towards 2030, United Nations World Tourism Organization, October 2011. 130 million Chinese tourists spend $115 billion overseas in 2017, China Travel News, March 2018. Bumper ‘Golden Week’ as Chinese make most of longer break, by Kristin Huang, China Morning Post, 8 October, 2017. China Tourism Statistics 2017, by the Ministry of Culture and Tourism of the People’s Republic of China. 2017 Global Travel Destination Report, Mafengwo, December 2017. 2017 Outbound Chinese Tourism And Consumption Trends, Nielsen, 2017. Global Power of Luxury Goods 2017, The New Luxury Consumers, by Patrizia Arienti, Deloitte, 2017. Chinese luxury consumers: More global, more demanding, still spending, by Lambert Bu, Benjamin Durand-Servoingt, Aimee Kim, and Naomi Yamakawa. McKinsey & Company, August 2017. The world’s 5 fastest growing cities for tourism are all in China, by Dan Murphy, CNBC, October 24, 2017. WeChat has hit 1 billion monthly active users, by Rayna Hollander, Business Insider, March 6, 2018.